Hatters boss John Still wasn’t prepared to make a comment on suspended duo Shaun Whalley and Ricky Miller until any charges have been brought against the pair. 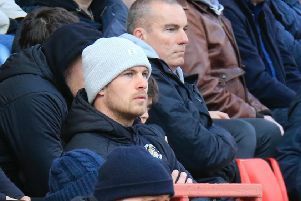 Both Whalley and Miller were arrested and then released on bail for an alleged incident with a taxi driver on Sunday morning, as they are now unavailable for Town’s last game of the season against Stevenage on Saturday. Still said: “I want to be fair to the football club, I want to be fair to the authorities that are dealing with it and I want to be fair to the players. “At the moment, everything that’s done has been tucked away, no-one’s been charged with anything and until that happens, I wasn’t there, so it’s difficult for me to make any comments on any allegations. “And if I do, I’m guessing. So all I can tell you is that two of our players were interviewed by the police over an incident, and because of that incident the club has felt it right to suspend the players. “As it stands at the moment, as I understand it, they’ve been cautioned, but not been charged.